If you looked out at your garden last winter and thought how dreary it looked, then this is a great time to add some plants that will cheer it up. There are many shrubs that will reward you with colour and interest over the winter months and you can choose a selection that suit your garden, whatever its size. Shrubs that flower in winter often have a stronger fragrance than summer-flowering ones because they need to attract the few pollinating insects that are around during colder weather. Site them near a door or window so you can appreciate the scent on a calm day. Within this group, there are both evergreen and deciduous plants. Evergreens will keep their leaves in winter to give the garden structure and provide shelter for birds and insects. Deciduous shrubs will shed their leaves, often in a blaze of colour in autumn before getting fresh new leaves in spring. Chimonathus praecox - the wintersweet bears heavily-scented, bell-shaped, yellow and red flowers in late winter on bear stems. The more unusual C. fragrans has violet-scented flowers. Corylopsis - various forms that flower on bare stems in winter. C. pauciflora has almond-scented flowers, C. spicata and C. willmottiae both have cowslip-scented flowers. 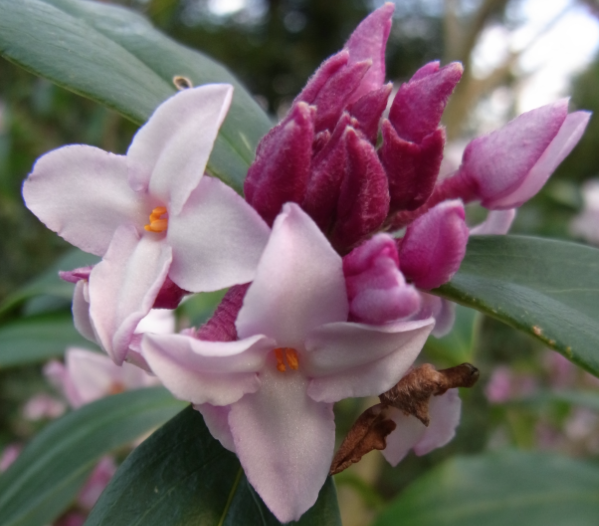 Daphne bholua - sweetly-fragrant pink flowers are produced in late winter-early spring amid glossy evergreen foliage. Look for the form ‘Jacqueline Postill’ or 'Peter Smithers' (pictured). Elaeagnus x ebbingei - unusual leaves and stems covered with bronze scales, much loved by flower arrangers. In autumn and into the winter, tiny flowers open under the leaves and give off a knock-out fragrance. They are so small, you often have to check exactly where the scent is coming from. Garrya elliptica - not flowers in the conventional sense, but the long tassels that this plant bears through the winter months look stunning with frost on. The form ‘James Roof’ has longer tassels. Hamamelis - the witch hazels are spreading shrubs, some of which need acid soil to grow well, but they are worth the effort twice a year: in autumn as the foliage turns fiery shades of red and orange and in late winter or early spring when the spidery flowers appear. Yellow, orange and red forms are available. Jasminum nudiflorum - not a shrub in the usual sense, because the long, whippy shoots are inclined to go where they want. Ideal trained against a wall or fence, where the bright yellow, sweetly-scented flowers can be appreciated all winter. Lonicera - the “shrubby honeysuckles” have small flowers, but great honey fragrance. L. purpusii has red flowers and L. standishii is cream-coloured. Sarcococca - long name, nice small-medium evergreen plant with flowers throughout the winter and dark green leaves. Stachyurus chinensis - slightly more unusual, but worth seeking out if you have the room for a medium-large shrub. The pretty hanging flowers smell of jasmine. Heather - winter-flowering heathers are low-growing, evergreen sub-shrubs, great as ground cover and they produce a stunning display as the temperature drops. Flower colours include reds, purples, pinks and white amid foliage that may be green, grey, gold or orange, many of which change as the season goes on and becomes more intense. * Avoid painted or dyed heathers, which will be plain green with white flowers once the colour wears off.